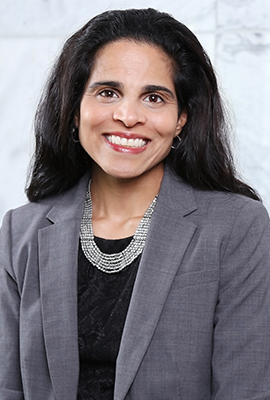 Usha Rodrigues leads courses in contracts, business ethics, business associations and securities regulation. She joined the University of Georgia School of Law's faculty in the fall of 2005 and was named the holder of the M.E. Kilpatrick Chair of Corporate Finance and Securities Law in 2014. She was awarded the title of University Professor in 2019. This designation is bestowed on no more than one UGA faculty member per year and is reserved for professors who have served as "change agents" for UGA and have had a significant impact on the university in addition to fulfilling their normal academic responsibilities. From 2015 to 2018, Rodrigues served as the school's associate dean for faculty development, and she has also served as the University Council's parliamentarian since 2014. Her work has appeared in the Virginia, Illinois, Iowa, Minnesota, Fordham, Emory, Florida, and Washington and Lee law reviews. She has also published in online fora of the Vanderbilt, UCLA, Texas and Harvard Business law reviews and in the peer-reviewed Journal of Corporate Finance. She has served as the chair of the Executive Committee of the Association of American Law Schools Business Associations Section and as the president of the Law and Entrepreneurship Association. She was elected to the American Law Institute in 2016. Law and the Blockchain, 107 Iowa L. Rev. 679 (2019). Tournament of Managers: Lessons from the Academic Leadership Market, 43 J. Corp. L. 537 (2018). Does Shareholder Voting Matter? Evidence from the Takeover Market, 53 Wake Forest L. Rev. 157 (2018) (with P. Mason, M. Stegemoller & S. Utke). Dictation and Delegation in Securities Regulation, 92 Ind. L.J. 435 (2017). Mispricing Corruption, 31 J.L. & Pol. 45 (2015). The Once and Future Irrelevancy of Section 12(g), 2015 U. Ill. L. Rev. 1529 (2015). What All-Cash Companies Tell Us About IPOs and Acquisitions, 29 J. Corp. Fin. 111 (2014) (with M. Stegemoller). The Effect of the JOBS Act on Underwriting Spreads, 102 Ky. L.J. 925 (2014). Ethical Issues for Transactional Attorneys Here and Abroad, 15 Transactions: Tenn. J.Bus. L. 593 (2014) (with C. Gofoth, C. Morgan and C. Plump). A Conflict Primacy Model of the Public Board, 2013 U. Ill. L. Rev. 1051 (2013). In Search of Safe Harbor: Suggestions for the New Rule 506(c), 66 Vand. L. Rev. En Banc 29 (2013). Exit, Voice, and Reputation: The Evolution of SPACs, 37 Del. J. Corp. L. 849 (2013) (with M. Stegemoller). Securities Law's Dirty Little Secret, 81 Fordham L. Rev. 3389 (2013). SPACs and the JOBS Act, 3 Harv. Bus. L. Rev. Online 17 (2012). Entity and Identity, 60 Emory L.J. 1257 (2011). Corporate Governance in an Age of Separation of Ownership from Ownership, 95 Minn. L. Rev. 1822 (2011). The Power of Warm Glow, 88 Tex. L. Rev. See Also 149 (2010). Placebo Ethics: A Study in Securities Disclosure Arbitrage, 96 Va. L. Rev. 1 (2010) (with M. Stegemoller). From Loyalty to Conflict: Addressing Fiduciary Duty at the Officer Level, 61 Fla. L. Rev. 1 (2009). The Fetishization of Independence, 33 J. Corp. Law 447 (2008). An Inconsistency in SEC Disclosure Requirements? The Case of the "Insignificant" Private Target, 13 J. Corp. Fin. 251 (2007) (with M. Stegemoller). The Seductive Comparison of Shareholder and Civic Democracy, 63 Wash. & Lee L. Rev. 1389 (2007). Let the Money Do the Governing: The Case for Reuniting Ownership and Control, 9 Stan. J.L. Bus. & Fin. 254 (2004). Race to the Stars: A Federalism Argument for Leaving the Right of Publicity in the Hand of the States, 87 Va. L. Rev. 1201 (2001).